Jennings Park in Marysville Washington wanted us to build a classic red monitor pole barn that could be rented out for local community and non-profit events. 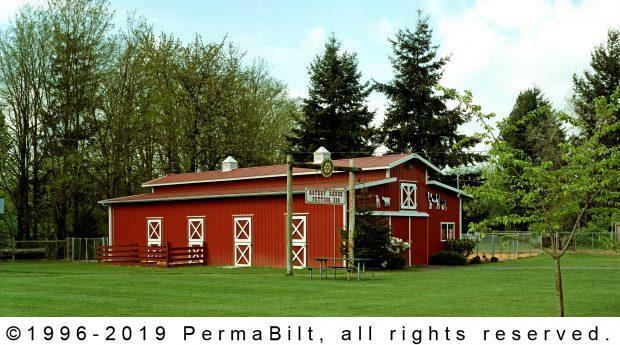 In working with our PermaBilt® Building Representative, local park and recreation officials designed a pole barn that reflected the spirit and community of Marysville yet was functional for any type of event. To begin, our clients chose a monitor pole barn with red siding and roofing giving it that classic, All-American barn look. Several 4’ x 8’ red steel Dutch doors with decorative cross hatch and trim were installed. These solid doors have four galvanized T-hinges, one galvanized barrel bolt and one galvanized gate latch and one galvanized hook and eye latch. All were galvanized and black powder coated. And what’s a classic barn if there aren’t any split sliding doors especially a second floor hayloft door? These sliding doors are built with the craftsmanship that PermaBilt® prides itself on. Each sliding door is constructed on site to assure the best possible fit and every door comes standard with aluminum side rails, aluminum bottom guides, handles and latches. And to complement the doors, two 4’ x 3’ insulated windows with decorative cross-hatching and screens were added for visibility, natural light and ventilation. Once erected, our client was happy to open the barn to the public in building community and town spirit. Many of our employees have had the opportunity to visit and enjoy the barn as well.